Over 1350 generous donors have already given a total of $172,000 to the Trees of Caring. This year’s goal is to raise $270,000 to help equip Cambridge Memorial Hospital’s new wing. Why not participate as part of your holiday gift giving by purchasing a single light or a string of lights to help light up the night AND help Cambridge Memorial Hospital Foundation reach their fundraising goal to make CMH the best equipped hospital in the Region. 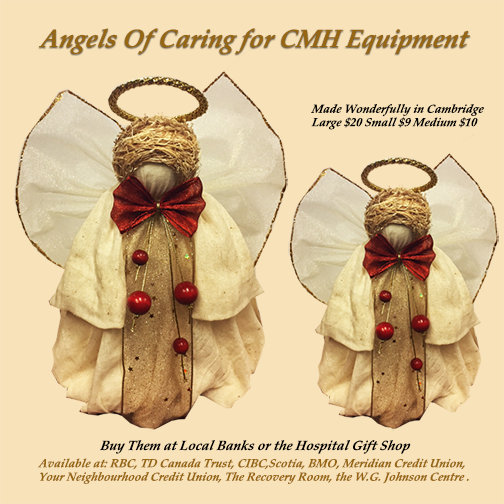 Minimally invasive surgical equipment is among the items funded by gifts to the CMH Foundation. In a Trees of Caring follow up letter arriving to homes this week Lisa Short, Foundation Executive Director and a lifelong Cambridge resident, shares her mother’s experience with cancer. CMH played a firsthand role in Lisa’s mother’s health a few winters ago. A routine colonoscopy discovered cancer in her mom’s colon. Diagnostic tools also found a mass on her mother’s kidney. Fortunately, the CMH surgical team was able to remove the masses using minimally invasive (laparoscopic) surgery. Laparoscopic surgeries require much smaller incisions than traditional operations and rely on sophisticated tools. Surgeons insert a slender tube, containing a tiny camera and surgical instruments, through incisions less than a half-an-inch long. For over 30 years our community has donated more than $5 million dollars to CMHF’s Trees of Caring. As we move closer to our seasonal goal the lights will continue to shine brightly along Coronation Boulevard until mid-January. Buying a ‘bulb’ ($10) or string of lights ($250) to light the Trees of Caring, will help to provide care and comfort to our patients. Donations can honour a caregiver, a loved one, or the memory of someone special. To make a donation to the Trees of Caring Campaign visit cmhfoundation.ca/donate at the link below OR call the Foundation directly at 519-740-4966.